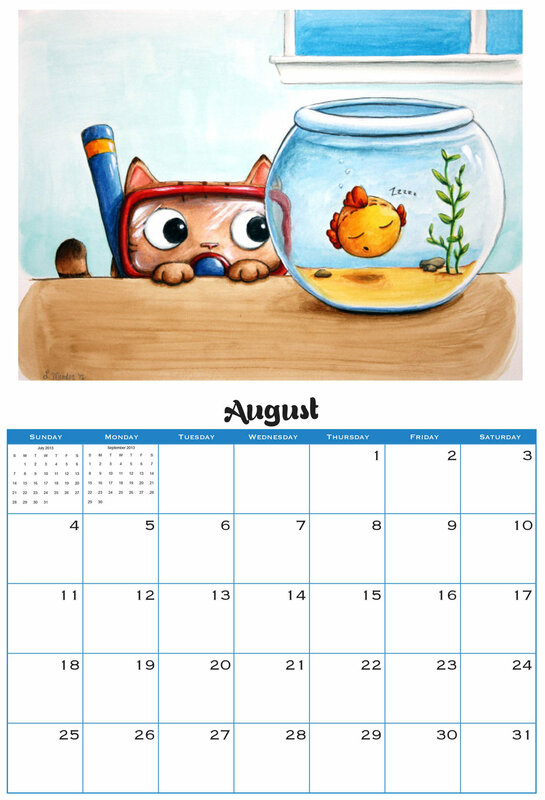 In 2012, my personal art project was to create a calendar for my family and friends. Since then I've been asked to create a new one each year. Life kinda happened during 2016 & 2017 but I'm excited to bring the tradition back! It's challenging to create a whole new set of 12 illustrations but it's definitely a project that I've grown to enjoy! Scroll to see all the years! 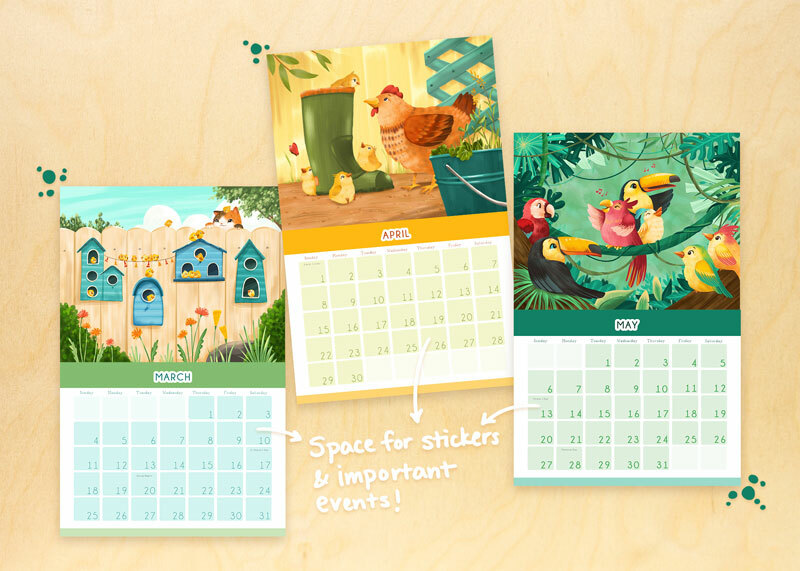 The diverse and colorful world of birds inspired Lauren’s 5th calendar! 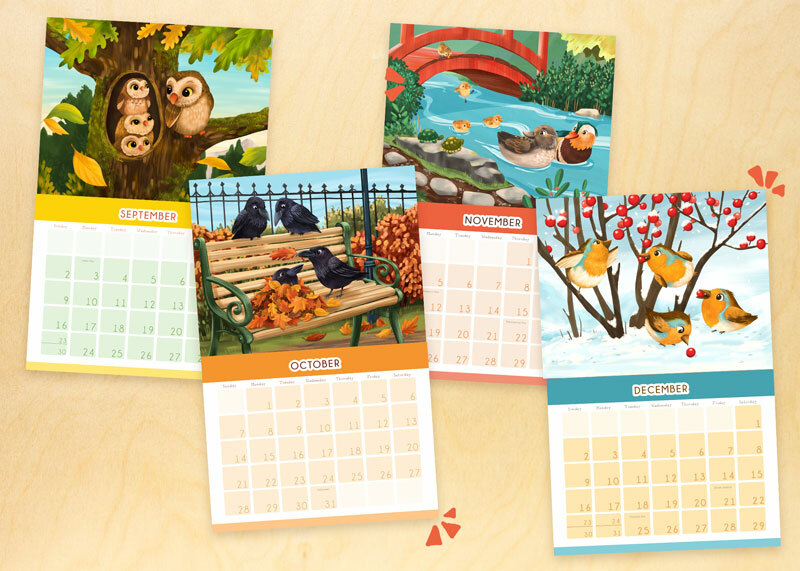 Each month features a new bird friend in their vibrant habitat. Chickadees making a tiny snowman in the forest, sandpipers sliding down the dunes, and parrots singing their jungle songs. 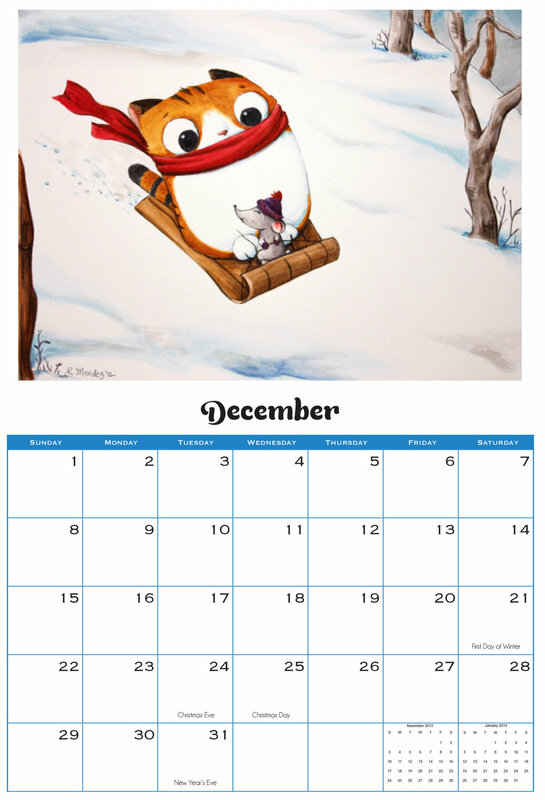 Calendar dimension: 8.5"x11" inches and include a hole for hanging. 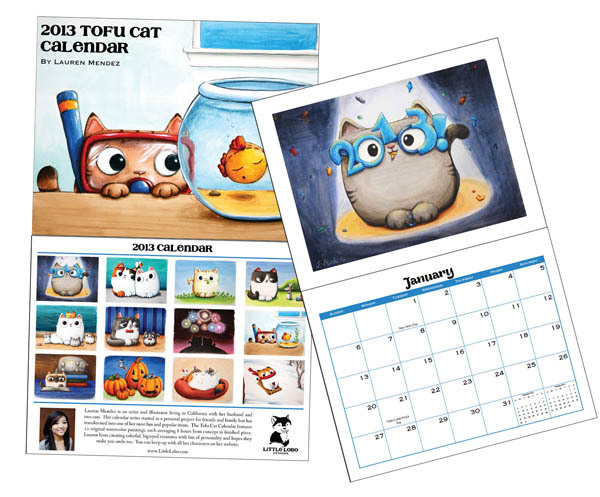 Full color and professionally printed on glossy thick paper. All new characters and illustrations! For 2015 I wanted to try stepping outside of my comfort zone and draw people, little cute girls to be exact. I decided to focus on the zodiac symbols since a majority of them are animal related. I also used the symbol shape of each zodiac sign as a starting point for the overall design of the character. Besides challenging myself to draw humans, I also focused on expressing personalities through different clothing details and patterns. During the summer of 2013, I started doodling some squishy bunnies in my sketchbook. They later became known as Gummy Bunnies and were always getting into mischief. 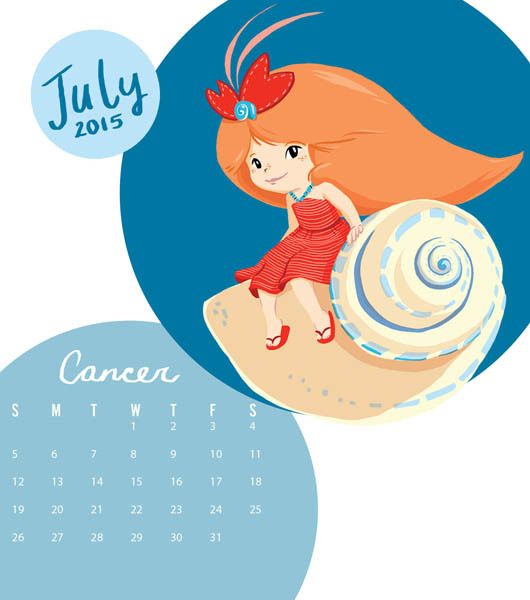 They eventually appeared in so many of my sketches that they were the obvious choice of theme for my calendar. This was my first time creating the images digitally. Since it was such a newbie I used mostly black lines and flat colors. 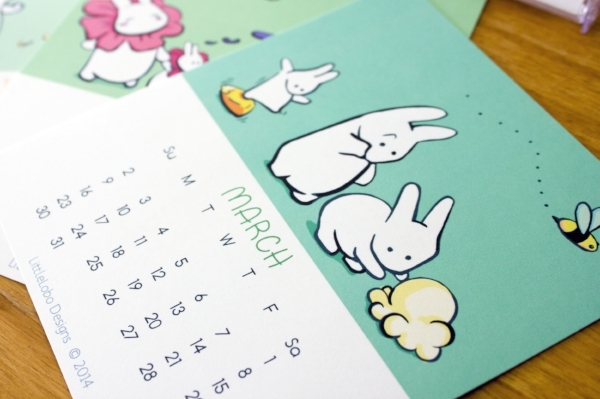 This time around I also wanted to use a more limited color palette compared to the Tofu Cat calendar from the previous year. 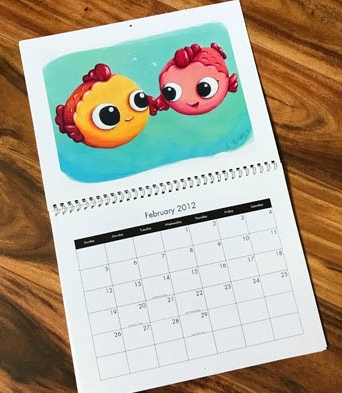 Out of all my calendars, this one remains a favorite with family, friends, and fans. It was fun to create illustrations based on the months, such as including snorkeling gear for the summer and snow during the winter. I was still mostly painting traditionally in watercolor but was starting to become interested in digital painting. All the crazy cats were completed in watercolor. 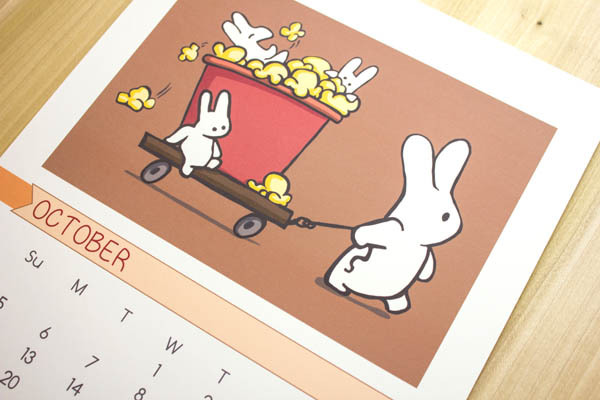 This was my first ever calendar! (aww) The idea began as a fun Christmas present for family and friends. It was printed last-minute at Costco and to my surprise, was a hit. At the time I wasn't painting digitally yet, so these were all done traditionally with watercolors.